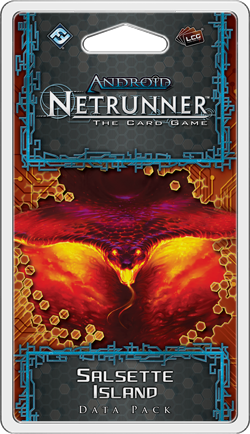 Fantasy Flight Games is proud to announce the upcoming release of Salsette Island, the fourth Data Pack in the Mumbad Cycle for Android: Netrunner! As Akshara Sareen and her Ēkatā Party ride the surging interest in clone rights to take a lead in the polls ahead of the Indian Union's national elections, Mumbad's corporate executives become increasingly willing to forge expedient and beneficial alliances in order to counter the party's growing political influence and preserve their existing business models. 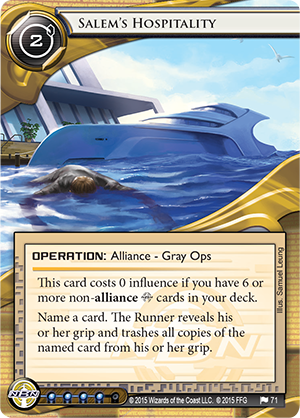 Accordingly, among the sixty new cards in Salsette Island (including a complete playset of nineteen different cards), you'll find powerful new alliance cards for each of the game's Corps, including assets and operations that feature variable influence costs and open the door to new types of Corporate deck builds. Meanwhile, from the slums to the ritziest of bazaars, Salsette Island's teeming streets offer the game's Runners myriad places from which they can launch clever new cyberassaults against the Corps. You'll find the game's three Runner factions making notable entrances to the slums, mingling at exclusive parties, hitting the bazaars, flying sports hoppers, and garnering the support of new patrons. 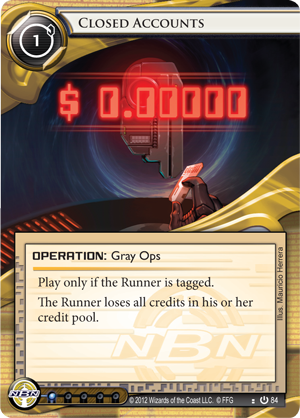 With a host of Runner cards that focus more on Mumbad's meatspace than the virtual world, Salsette Island allows you to press your attacks against the Corps more effectively on every front. 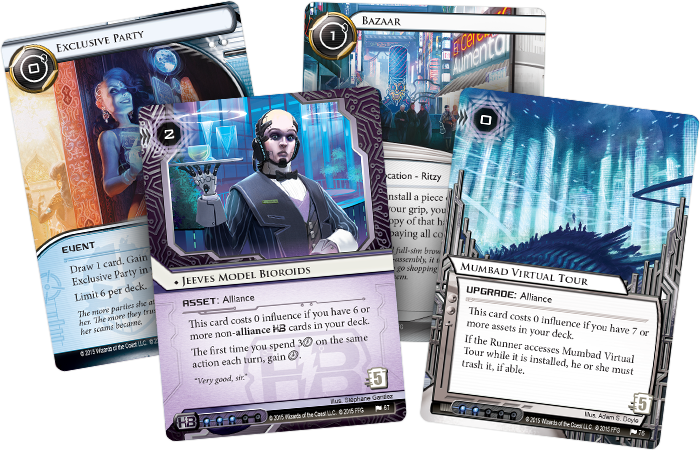 While it's obvious that the debates over clone rights taking place during the Indian Union's national elections leave Jinteki immediately vulnerable, many of the game's top Corporate executives have begun taking a longer view, realizing that Jinteki wouldn't be the only company to suffer should the Ēkatā Party or other groups aligned with the Simulant Abolitionist Movement emerge victorious. The decision to give clones full citizenship and the rights inherent to citizens of the Indian Union could spur massive changes in the nation's labor force—changes to wages and worker privileges that could easily lead to large-scale disruptions in the whole world's economy. Ultimately, these are risks that don't just concern Jinteki; they concern top execs in every field. Thus, Salsette Island finds the Corps responding to these risks by forming different alliances. 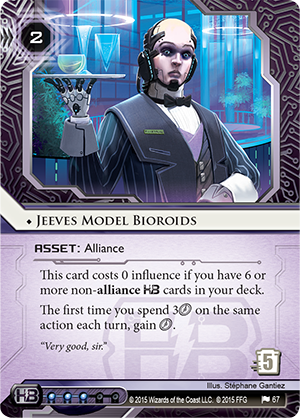 New to the Mumbad Cycle, alliance cards, like Jeeves Model Bioroids (Salsette Island, 67) and Executive Search Firm (Salsette Island, 72), permit new deck-builds that reward the partnerships between Corps with reduced (often free) influence costs. Notably, the handful of alliance cards in Salsette Island include Jinteki VP Raman Rai (Salsette Island, 68), whose ability provides cooperative Corps with the means to work with fantastic consistency. 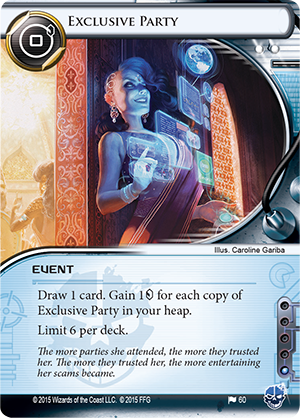 When you draw a card, Raman Rai allows you to lose a click to trade it with a card of the same type in Archives. 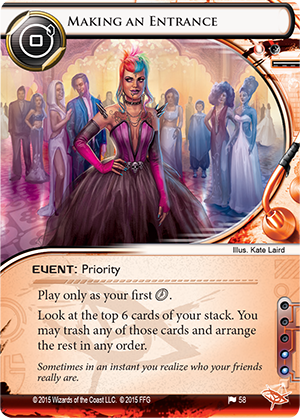 You make your decision about whether or not to use Raman Rai's ability when you see the card you draw—not before—so you'll always know if it's worth sacrificing your Closed Accounts (Core Set, 84) and a click, for instance, in order to recover a copy of Salem's Hospitality (Salsette Island, 71). 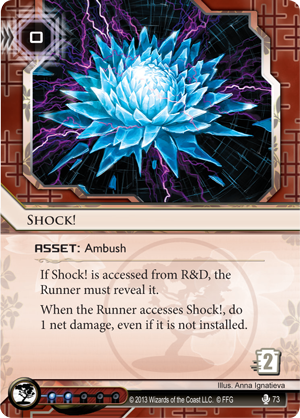 Or you might discard Shock! (True Colors, 73) when you draw it in order to add another Snare! (Core Set, 70) back to your hand. 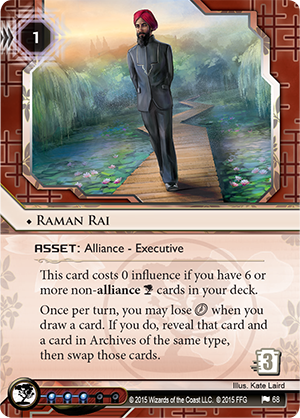 Raman Rai adds consistency to your deck because his ability allows you to recover the cards you've used, meaning you don't have to work so hard to draw the other copies you built into your deck. In a way, Raman Rai is all about continuing the business you've been doing, as you've already done it. He'd tell you that there's no need to shake things up. 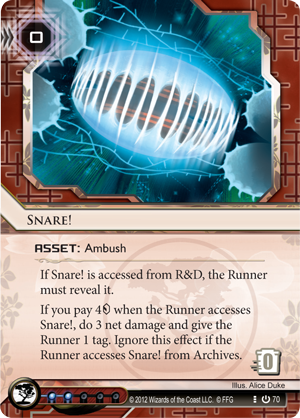 It's better business for everyone to keep doing things the way they've always been done, and that's why the other Corps should work with Jinteki and against the Simulant Abolitionist Movement. 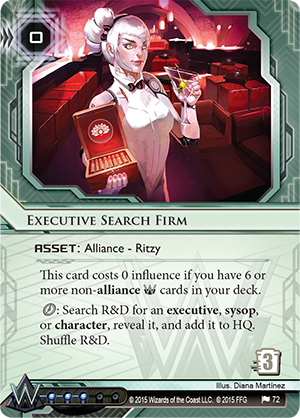 With its new alliance cards, plus powerful events like Making an Entrance (Salsette Island, 58) and Exclusive Party (Salsette Island, 60), Salsette Island permits the exploration of a wide range of new deck types for both Corps and Runners. How will you use them? Salsette Island is scheduled to arrive at retailers in the first quarter of 2016!